Every summer, I enjoy VC Rocks. The VC stands for "Virtual Convention." Those of us who are Stampin Up demonstrators or just Stampin Up lovers participate in swaps, games, online chats, and online courses. Shari Dudek taught a class this year on the "Expanding Star Card." You can find directions to make your own Expanding Star Card on Shari's website "Shari's Stamp Pad" by clicking here. I've also been trying to stretch my stamping abilities so I have been looking online for challenges. I found this challenge on Hand Stamped Sentiments. 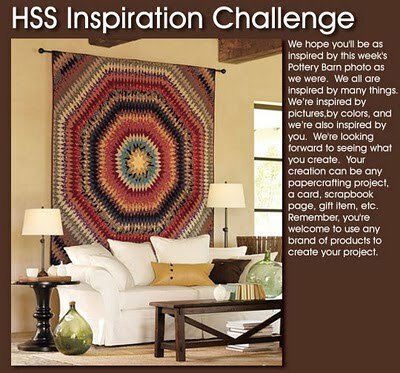 The challenge comes from a page in a Pottery Barn catalog and you could create anything- card, 3D item, etc. as long as it was inspired by this page. Well, when I saw the HSSIC challenge, I knew it was time for the challenge and the Expanding Star to meet! I hope you like it!